Each bottle will feed 400 square feet. In-ground or container vegetable, fruit and herb gardens. 1. Attach LiquaFeed® Universal Feeder to spigot, and attach a hose to base of Feeder. Feeder can also be placed on the ground and used in line between two hoses. 2. Insert LiquaFeed® plant food bottle by twisting into Feeder. Rotate bottle until vertical. 3. Turn knob to FEED. Turn on water and begin feeding with any watering device! Watering times will vary depending on the watering device used. 2. Insert Liquafeed® refill bottle by removing cap and twisting into Liquafeed® feeder. 3. Feed by spraying the soil at the base of the plant until soil is saturated. One plant food bottle will last approximately 15 minutes with continuous use. Use to feed in-ground or container fruit, vegetable, or herb gardens. Automatically mixes the right amount of nutrients to take the guesswork out of feeding. Helps grow high-quality fruits and vegetables. 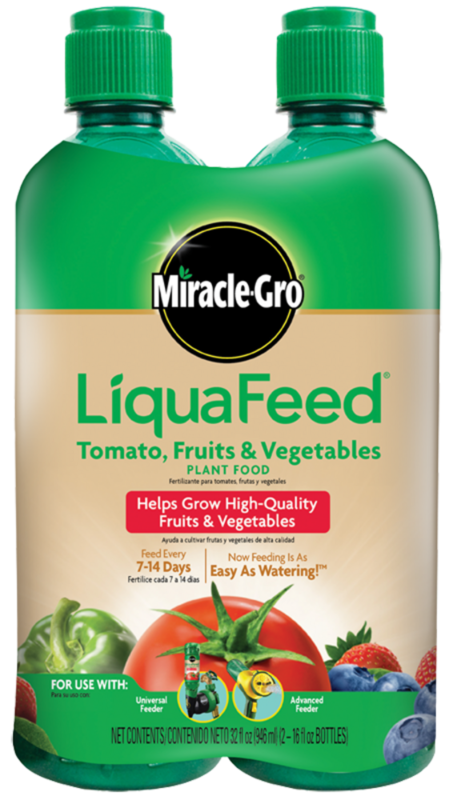 Miracle-Gro® LiquaFeed® refill bottles are for use with the Miracle-Gro LiquaFeed® Advance Feeder and LiquaFeed® Universal Feeder. All plants including flowers and edible plants. One of the LiquaFeed Feeders should be used to apply/dilute plant food with water. With use with the LiquaFeed Universal Feeder, feeding time will vary depending on watering devices used.